Locals and visitors love Cape Sounion. Around 43 miles (69km) east of Athens, the popular seaside resort is famous in Greek Mythology. 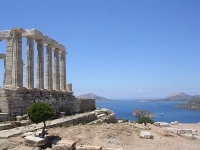 Its best-known feature is the 5th-century BC Temple of Poseidon. Perched on the cliffs above the town, it's said to be where King Aegeus waited for his son, Theseus, who'd left to slay the Minotaur of Crete. The story goes that Theseus hoisted the wrong colour sail on his return, convincing his father he'd died fighting the Minotaur. In his grief, the king threw himself from the cliffs and gave the Aegean Sea its name. Visitors can enjoy some beautiful views from the temple. Otherwise, the cape's coastline is worth exploring and its restaurants are good.